When ambient air flows through porous media, it carries moisture. In this process, temperature and moisture are coupled: The vapor saturates depending on the temperature conditions, while latent heat effects due to evaporation and condensation modify the temperature. We discussed heat and moisture transport in air in a previous blog post. Let’s address the specific transport processes we need to consider in pores and how to model heat and moisture transport in porous media with the COMSOL Multiphysics® software. 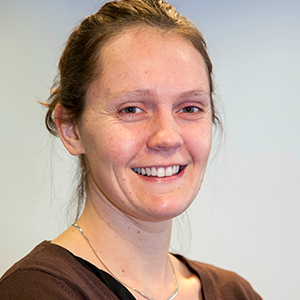 Building physics engineers aim to improve the energy performance and sustainability of building envelopes. Although their practices are based on past experience, new materials and building techniques are constantly being developed that offer a wide set of options in building design and thermal management. Let’s see how to model heat and moisture transport in building materials to help reduce energy costs and preserve buildings. 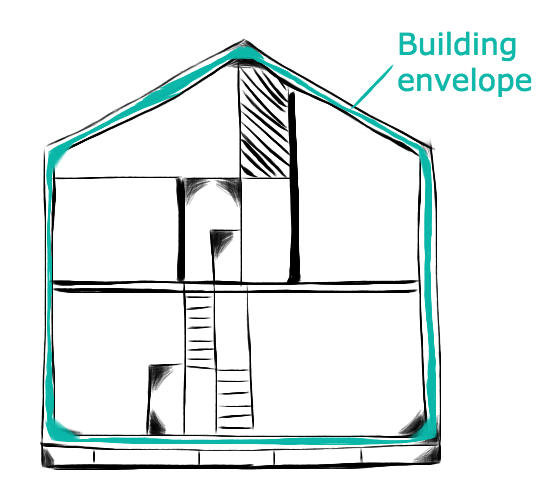 Building envelopes can be analyzed by modeling heat and moisture transport. Controlling moisture is necessary to optimize the thermal performance of building envelopes and reduce energy costs. The thermal properties of insulation or isolation materials usually depend on both temperature and moisture content. Therefore, a coupled heat and moisture model helps us fully analyze the thermal performance of a building component. 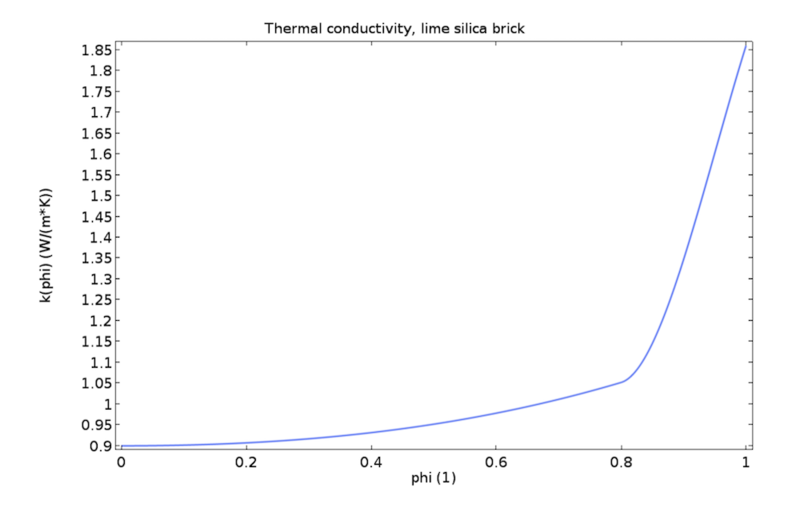 One example is the dependence of a lime silica brick’s thermal conductivity on relative humidity. The moisture dependence of thermal conductivity for lime silica brick. The figure above shows that lime silica brick becomes two times less thermally isolating for high relative humidity values. Let’s consider a wood-frame wall between a warm indoor environment and a cold outdoor environment. Vapor diffuses through the wall from the high-moisture environment inside to the low-moisture environment outside. This creates high relative humidity values associated with low temperature values close to the exterior panel, with the risk of condensation as a direct consequence. The relative humidity distribution in a wood-frame wall. Condensation leads to mold growth, which directly affects human health and building sustainability. The rate of mold growth is key data for the preservation of historical buildings, for example. To prevent the risk of interstitial condensation, it is common practice to add a vapor barrier between the interior gypsum panel and the cellulose isolation board. This reduces the moisture values where they are at a maximum. The figure below shows the relative humidity distribution across the wood-frame wall through a wood stud (red lines) and a cellulose board (blue lines), with and without the vapor barrier (dashed lines and solid lines, respectively). 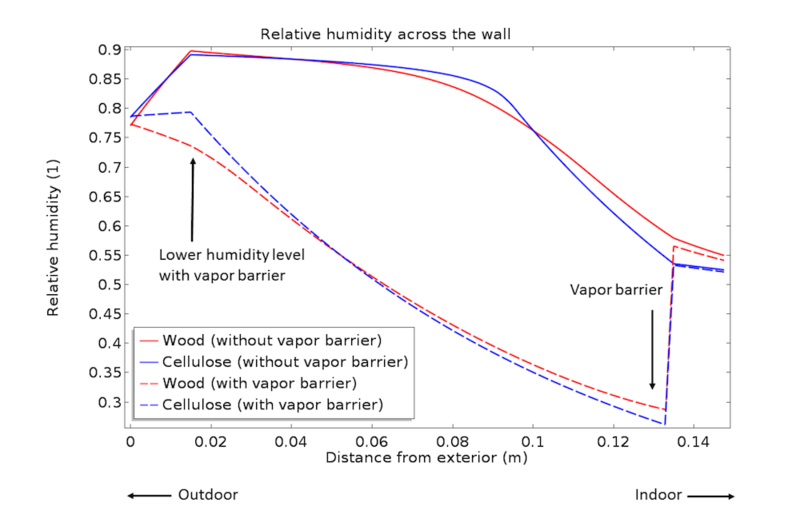 Effect of a vapor barrier on relative humidity distribution across the wood-frame wall in a wood stud and cellulose board. For this model, we consider the building materials to be specific unsaturated porous media in which the moisture exists in both liquid and vapor phases and only some transport processes are relevant. The norm EN 15026 standard addresses the transport moisture phenomena that is taken into account in building materials, following the theory expressed in Ref. 1. The transport equation established as a standard by the norm accounts for liquid transport by capillary forces, vapor diffusion due to a vapor pressure gradient, and moisture storage. In addition, the moisture dependence of the thermal properties is assessed. 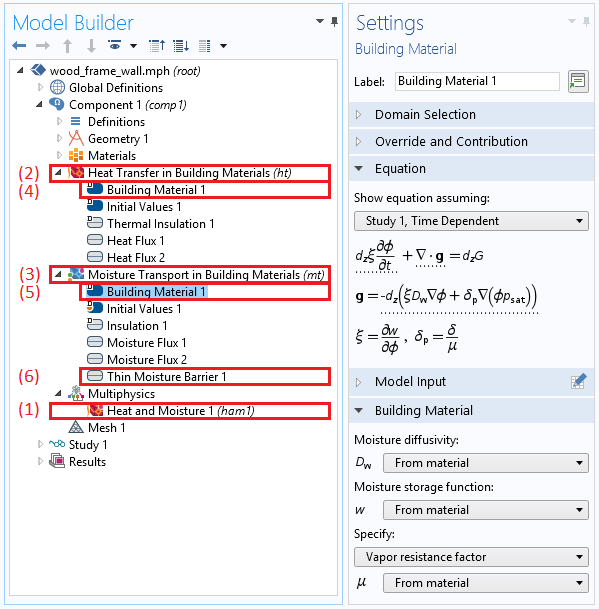 Find details about the moisture transport equation in building materials in the Heat Transfer Module User’s Guide. Finally, the latent heat source due to evaporation is added to the heat transfer equation by the Building Material feature of the Heat Transfer interface. The model tree and subsequent subnodes when choosing the Heat Transfer in Building Materials interface, along with the Settings window of the Building Material feature. Modeling heat and moisture transport in an unsaturated porous medium is important for analyzing polymer materials for the pharmaceutical industry, protective layers on electrical cables, and food-drying processes, to name a few examples. For these applications, phenomenological models, such as the one presented above for building materials, may not be available. However, by considering the conservation of heat and moisture in each phase (solid, liquid, and gas), and volume averaging over the different phases, we can derive a mechanistic model. To compute the moisture distribution, we solve a two-phase flow problem in the porous medium. Two equations of transport are solved: one for the vapor and one for the liquid water. The coupling between the vapor and liquid water operates through the definition of saturation variables, Svapor + Sliquid = 1. The changing water saturation is taken into consideration for the definition of the effective vapor diffusivity and liquid permeability. In this definition, the equilibrium vapor concentration, defined as the product of the saturation concentration csat and the water activity aw, is used to account for the porous medium structure. Indeed, due to capillary forces, equilibrium is reached for concentrations that are lower than in a free medium. By letting the evaporation rate K go to infinity, an equilibrium formulation is obtained with the vapor concentration equal to the equilibrium concentration. Let’s consider a food-drying process. A piece of potato, initially saturated with liquid water, is placed in an airflow to be dried. Inside the potato, the vapor is transported by binary diffusion in air. We use a Brinkman formulation to model the flow induced by the moist air pressure gradient in the pores. As the liquid phase velocity is small compared to the moist air velocity, Darcy’s law is used for the liquid water flow due to the pressure gradient. The capillary flow, due to the difference between the relative attraction of the water molecules for each other and the potato, is also considered in the liquid water transport. The vapor and liquid water distributions over time for this model are shown in the following two animations. Note that water can leave the potato as vapor only. The liquid water concentration over time. The water vapor concentration over time. The evaporation causes a reduction of the temperature in the potato. The temperature distribution over time is shown below. You can implement the equations in the Heat Transfer in Porous Media interface within the Heat Transfer Module and the Transport of Diluted Species interface within the Chemical Reaction Engineering Module. This process requires some steps in order to couple the multiphase flow in a porous medium together with the evaporation process. Read the article “Engineering Perfect Puffed Snacks” on pages 7–9 of COMSOL News 2017 to see how Cornell University researchers used COMSOL Multiphysics to model rice puffing. In this numerically challenging process, the rapid evaporation of liquid water results in a large gas pressure buildup and phase transformation in the grain. In this blog post, we discussed COMSOL® software features for modeling heat and moisture transport in porous media. COMSOL Multiphysics (along with the Chemical Reaction Engineering Module and Heat Transfer Module) provides you with tools to define the corresponding phenomenological and mechanistic models for a large range of applications. Depending on the dominant transport processes, you can use predefined interfaces or define your own model. Künzel, H. 1995. Simultaneous Heat and Moisture Transport in Building Components. One and two-dimensional calculation using simple parameters. PhD Thesis. Fraunhofer Institute of Building Physics. Thanks for your kind information. Here i want to know one more thing that, is there any possibility to study/analyse the hygro-thermal effects on vibration of functionally graded beams. Hi, it should be possible to add a structural mechanics computation in which the Young modulus will be set as a function of the relative humidity computed in the heat and moisture transfer problem. However, there is no predefined physics interface for that. Your blog is very helpful and thank you for your work. I am currently dealing with a THM model in soil, where includes the water-vapor transportation under temperature gradient in an unsaturated soil column. I’ve tried to use PDE module to build up my own model, however, it is very difficult to get a convergent calculation result. Do you think it can be done using the predetermined modules? On the side of the predefined interfaces, there is the Transport of Diluted Species in Porous Media interface, that can be applied to a partially saturated porous medium. You can use it twice in your model, once with the liquid phase, once with the gas phase, and then couple the two sets of equations through saturation conditions. I suggest that you have a look at the “Evaporation in Porous Media with Large Evaporation Rate” model that you can find in the Application Library, Heat Transfer>Phase Change branch. But you’re right, the convergence of a model solving for both phases is more challenging than for a model solving for relative humidity. Many thanks to your suggestion. Results turns out better than building my own PDEs, at least convergence is much easier to get. Thanks for a very good application. As you mentioned, “K” is an evaporation rate depending on the application. I had found that “K” significantly affects the evaporation amount and heat. In COMSOL’s examples, the “K” is always set as a constant. However, “K” should be varied with the time, since the temperature difference between the water-containing media and the gas is getting small along the time. And the “K” should be varied with the temperature, the gas flow rate, etc. Could you share where to find detail information on how to determine the evaporation rate. Thank you very much. Also, the Chilton–Colburn analogy is implemented since Version 5.3a in the Moisture Flux boundary condition. For a set of different flow (natural/forced convection) and geometry conditions, you can obtain the convective heat transfer coefficient from correlations based on Nusselt number, and the analogy is applied to compute the moisture transfer coefficient.